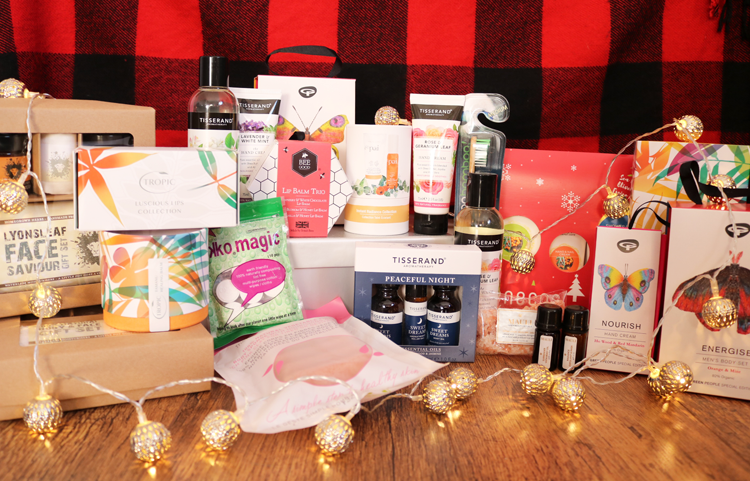 Searching for that perfect gift for your green beauty obsessed friend, or want to find a present that's more environmentally friendly this year? Look no further, this is the Christmas Gift Guide edit for you! 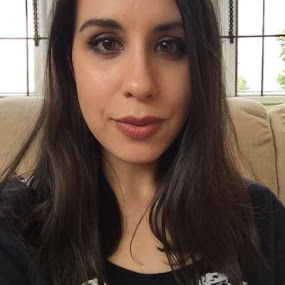 Lyonsleaf are one of my favourite British green beauty brands. 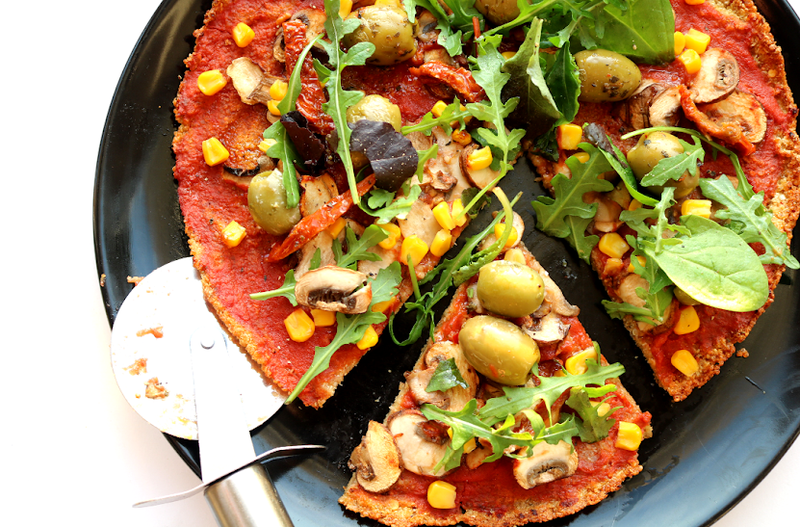 They're a small, independent company with a great ethos, and their formulas are all 100% natural and water-free, so they don't need to use any preservatives. They've released three new gift sets this year which will appeal to anyone interested in affordable natural skincare and oil/hot cloth cleansing. Lyonsleaf Hot Cloth Cleansing Gift Set (£9.99, link) contains their bestselling Beauty Balm (30ml), a fab multi-purpose cleanser and moisturiser that I've mentioned a couple of times over the years (read my recent review of it here). This set also comes with a white cotton face flannel and two muslin face cloths. 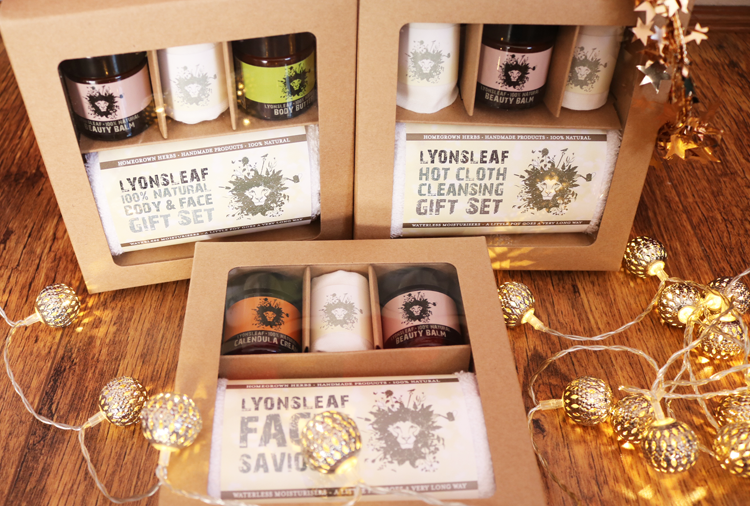 For two larger sets, the Lyonsleaf Natural Body & Face Gift Set (£12.99, link) houses Beauty Balm (30ml), their super hydrating Body Butter (30ml), a white cotton face flannel and two muslin cloths, whilst the Lyonsleaf Face Saviour Gift Set (£14.99, link) contains Beauty Balm (30ml), Calendula Cream (30ml), a white cotton face flannel and two muslin cloths. Really great value for money sets with generously sized try me products, and minimal packaging. 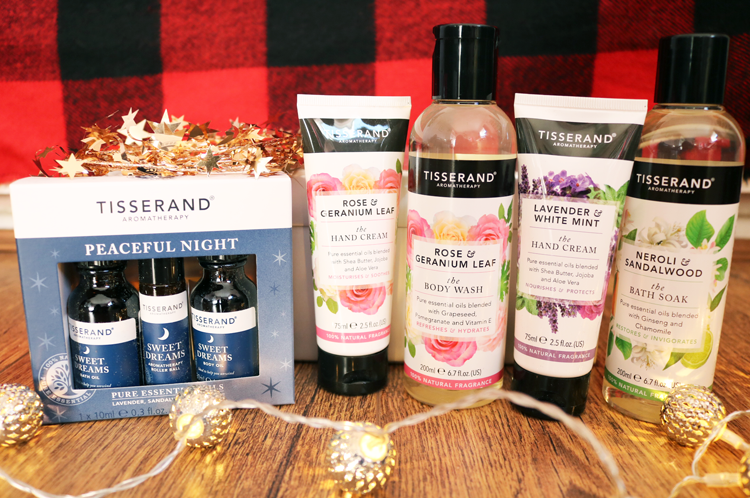 Aromatherapy themed gifts are always popular and Tisserand are one of the best-selling brands on the market. Their Peaceful Night Set (£9.95, link) features a trio of products from their Sweet Dreams range which has a special blend of Lavender, Sandalwood and Jasmine essential oils to help you drift off to sleep. This set contains the Sweet Dreams Bath Oil (30ml), Sweet Dreams Aromatherapy Roller Ball (10ml full size) and Sweet Dreams Body Oil (30ml). I'm a frequent user of this range and it does help! For single gifts that you can utilise for stocking fillers and secret santas, have a look at Tisserand's new bath and body collection for luxury pampering treats such as their Rose & Geranium Leaf Hand Cream (75ml, £7.95, link), Rose & Geranium Leaf Body Wash (200ml, £9.95, link), Lavender & White Mint Hand Cream (75ml, £7.95, link) and Neroli & Sandalwood Bath Soak (200ml, £10.95, link). Gorgeous SLS/SLES free formulas, cruelty free and suitable for vegans. I wanted to include a couple of environmentally friendly gifts that I could recommend to those who want to give a Christmas present that doesn't send their carbon footprint through the roof, so I found these three which would be perfect as stocking fillers / single gifts. 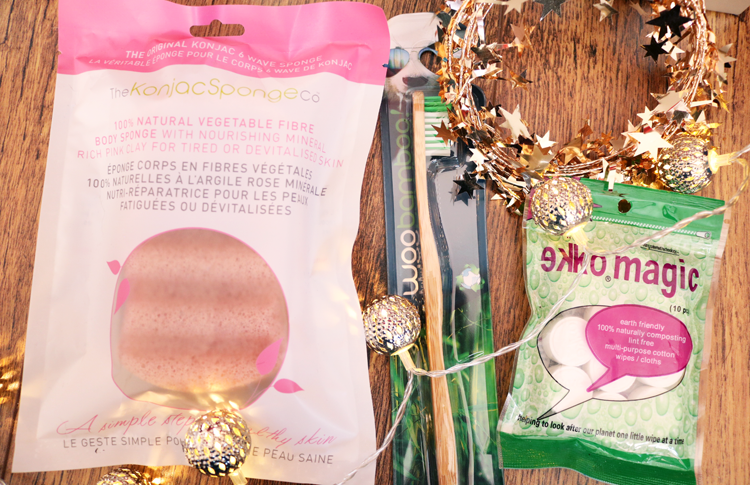 Konjac sponges are really cool because they're gentle on the skin, are made from 100% natural vegetable fibres (from the konjac plant) and are fully compostable/degradable when you're finished with them. 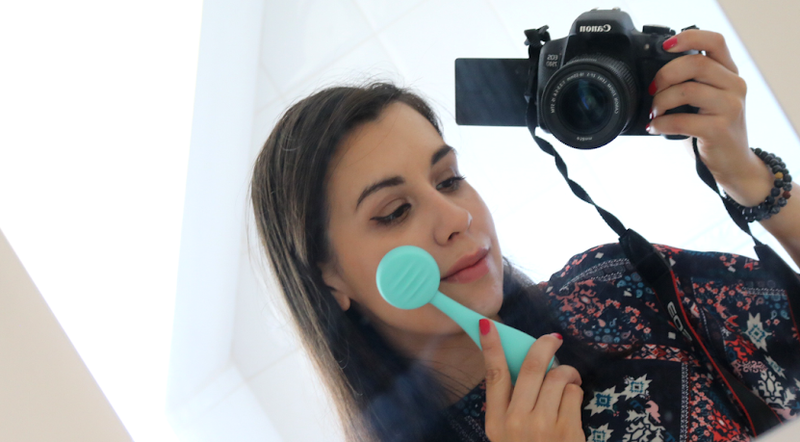 I've used their facial sponges on and off for a few years, but have recently started using The Konjac Sponge Co Pink Clay Body Sponge (£11.99, link) in the shower with my body washes. Once saturated with water, it gently exfoliates, and helps to soften and brighten up dry, dull skin. This one's infused with French Pink Clay so you can use it on its own for a deep cleansing mineral rich experience. If you're concerned about the billions of plastic toothbrushes which end up in landfills around the world every year, a WooBamboo Toothbrush (£3.30, link) is an eco-friendly gift that you give to encourage friends and family to make a small, but significant change towards helping to protect the planet. The handle is made from sustainable and biodegradable bamboo with high quality, dental grade bristles that are non-toxic and BPA free. WooBamboo have a whole range of these including toothbrushes for your pets, so that everyone in the family can become more eco-friendly! Disposable wipes are another problem facing the sustainability and health of the planet, but with Ekko Magic Wipes (10 wipes, £3.25, link), you can help to change this. These compressed cotton, multi-purpose wipes are lint-free, reusable and 100% biodegradable/compostable. Simply add water or your choice of cleanser etc, and watch them unfold. An ideal alternative to makeup and baby wipes, they're soft and gentle on even sensitive skin. This year, Green People have partnered up with the British charity, Butterfly Conservation, to showcase a new special edition gift collection that has been lovingly illustrated by Green People's very own in-house designer Anna Parkinson. For every one of these special gifts sold, Green People will make a donation to the Butterfly Conservation which will be used to support their vital work in protecting and preserving British butterflies, moths and the environment. This collection has really appealed to me because I've studied butterflies as part of a case study for my degree earlier this year, and they are vitally essential to the biodiversity of our environment, yet many species are in serious decline due to loss of habitat, pesticides usage and climate change. Show your support with the Joyful Gift Set (£19.95, link) features a Body Wash (100ml) and Body Lotion (100ml) in a mood-boosting, uplifting aroma of Tangerine & Cypress which reminds me of summer holidays and clear blue skies. For the men in your life, try the Energise Gift Set (£17.95, link) which has a Mint & Eucalyptus Hair & Body Wash (100ml) and a festively warming Orange & Clove Hair & Body Wash (100ml). On a budget or just after a stocking filler? 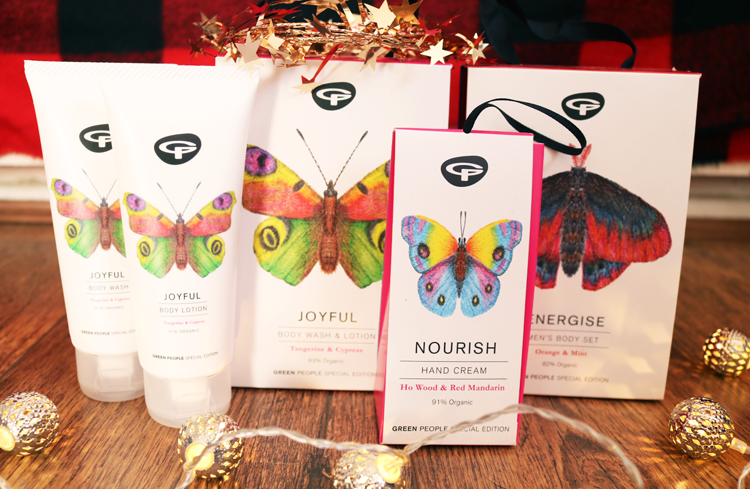 The Nourish Set contains a Ho Wood & Mandarin Hand Cream (30ml) which is 91% organic and can be hung up on the tree! 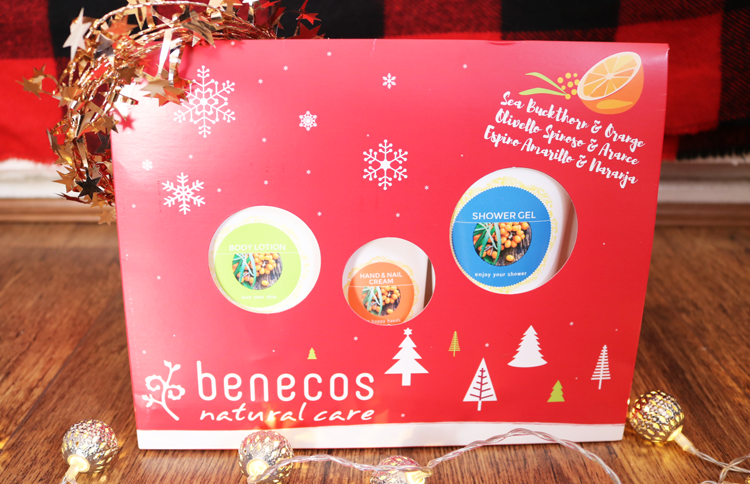 For a complete bath & body gift set, you can't go wrong with something like Benecos Sea Buckthorn & Orange Body Care Christmas Gift Set (£10.95, link). Inside, you'll find three full size products, Body Lotion, Shower Gel and Hand & Nail Cream, which are all in Benecos' uplifting Sea Buckthorn & Orange natural scent. Free from artificial fragrance and colours, parabens, SLS, petroleum ingredients, and certified by the Vegan society. I love the festive packaging too! 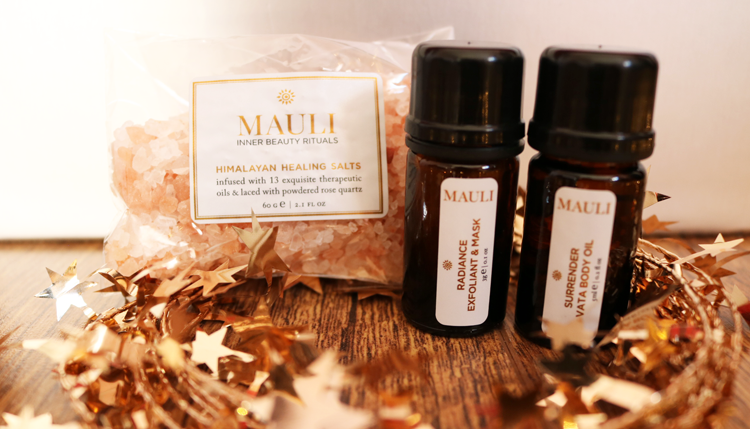 Mauli Rituals are a new to me luxury eco-brand who have some gorgeous all natural products based on Ayurveda principles. Everything has been formulated holistically to respect this ancient Indian approach to wellbeing, so they're perfect to give to anyone who needs some essential 'me-time' pampering like a stressed out new mum or a workaholic friend. The minis above are just three of the products that are available in their Revive The Senses Set (full set is £36, link), and I've had a real pleasure trying out the Himalayan Healing Salts (very similar to my favourites from Therapie), Radiance Exfoliant & Mask (gentle powder formula that you mix up with rose water or milk for a detoxing effect), and Surrender Body Oil (lovely comforting and relaxing blend). Pai are one of those skincare brands that are suitable for all skin types, including sensitive, as they have gentle, fuss-free formulas with great organic ingredients. Their Instant Radiance Collection (£14, link) is a really good way to introduce a friend to the brand as it contains two of Pai's bestsellers in convenient travel sizes; Kukui & Jojoba Bead Skin Brightening Exfoliator (15ml) and Rosehip BioRegenerate Oil (10ml). Say hello to brighter, younger looking skin! You can't get any better than a set of lip balms for a lip balm addict can you?! I would love to receive something like this under the tree this year. 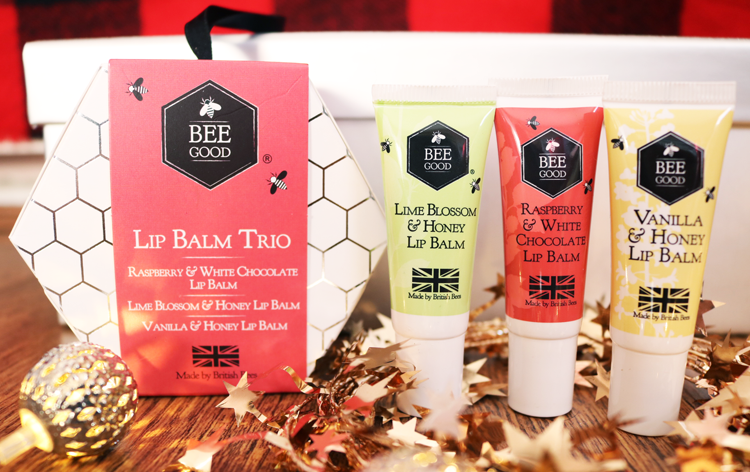 Bee Good's Lip Balm Trio (£10, link) has three full-size lip balms in an assortment of yummy flavours, Lime Blossom & Honey, Raspberry & White Chocolate and Vanilla & Honey. These have a fantastic moisturising formula and are sure to keep chapped lips as bay this Winter. 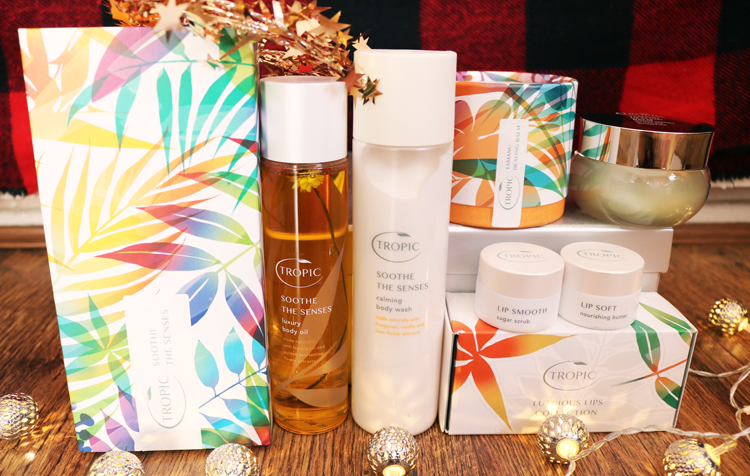 If your recipient loves luxury pampering, Tropic Skincare is definitely a brand to look into. They have a wide range of products and collections, and everything has a relaxing, spa-like feel to them which I can totally get on board with! The brand are cruelty free, vegan society certified and free from a long list of 'nasties'. Their Soothe The Senses Body Collection (£34, link) comes packaged in a fun, vibrant tropical print and contains two full-size products to create a spa at home with. There's the Calming Body Wash which is scented with Frangipani, Vanilla and Tiare Flower, and the Luxury Body Oil to use afterwards with its delicate fragrance of Frangipani and Golden Everlasting Flower. One of Tropic Skincare's bestselling award winners is the Tamanu Healing Balm (£32, link), a huge jar of an exceptional multi-purpose balm that contains just Organic Tamanu Oil, Monoi Butter, Organic Shea Butter, Organic Blackcurrant and Cranberry Seed Oils, Organic Cocoa Butter, Organic Soy Wax and Vitamin E. It's thick, luxurious and does a fantastic job of healing and repairing damaged and dry skin. Lastly, if you want a more budget-friendly option, try their Luscious Lips Collection (£15, link) which includes a full-size Lip Smooth sugar scrub a full-size Lip Soft, a super nourishing and hydrating natural formula which will moisturise and protect lips against the elements. Really love these two! Looking for more Christmas gift inspiration? 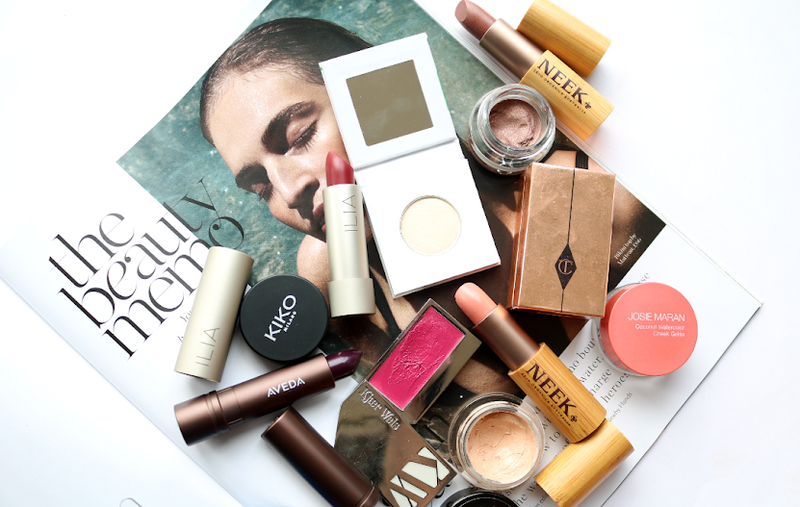 Check out my Luxury Brands Edit here and my Budget Friendly Edit here.